A hillfort, with middle and late Bronze Age occupation evidence (from excavation). The defences consist of a single rampart and ditch with lower counterscarp bank. Several 'hut' platforms were excavated by Manchester University in the 1960s and the site is protected as a Scheduled Monument. Mam Tor is the largest of a small group of hillforts in the Peak District and has defences consisting of a rampart, ditch and counterscarp bank. The single bank, 7.6m to 9.1m above a bedrock cut ditch 1.8m deep by 1.8m wide, encloses a tongue-shaped area of about 6.5ha. There are indications of a double-inturned entrance at the N end and a semi-inturned entrance to the south. A portion of the defences at the SE have been destroyed by land slides. The evidence suggests that there were possibly three phases of construction of the defences: (1) A timber palisade or revetment, (2) an earlier rampart and (3) the present rampart and ditch. The hillfort is a nationally important archaeological site dating from the Bronze Age and is looked after by the National Trust and Historic England as a Scheduled Monument (NHLE: 1011206). The internal features include evidence of occupation in the form of prehistoric huts and platforms, two barrows (NT Sites 60454 and 60455) and the Peak Forest Wall (NT Site 60467). [1 -2] Visible signs of occupation are the so-called "hut platforms" - scoops all around the hill crest, up to 5m in diameter, cut into the slopes. These are so numerous as to question whether they are all occupation remains, some are likely to be quarry hollows or working areas. Several platforms were excavated by Manchester University in 1965-9 (see ENA1106), one of which was found to contain an internal hearth, yielding pottery and finds of the Middle and Late Bronze Age together with charcoal dated to the same period by means of radiocarbon dating. Finds included vast quantities of pottery and also a polished stone axe, a bronze axe fragment, 4 whetstones and fragments of shale bracelets. The 1960s excavations were written up by Dr. D. G. Coombs and F.H. Thompson in 1979 as an article in the Derbyshire Archaeology Journal (Volume 99) and the finds from the excavations are held at Sheffield Museum, some of which are on display. A study of the aerial photographs show that the distribution of these hut features is not uniform over the hill - there appears to be a clear area in the NW section. Some of the photographs appear to show the features in groups (SZE8300 & SZE10240). In 1993 Trent & Peak Archaeology undertook an excavation of 8 trenches around the barrows located within the summit of the hillfort (NTSMR 60455). Trench 1 demonstrated that the lower levels of a barrow survive in a good state of preservation directly beneath the eroded surface of the summit-area. It seems likely that the primary element in its construction was a low cairn, which , if round, would have been about 6m in diameter (and its remains would then lie entirely to W of the OS pillar). The cairn appears not to have been truncated by the modern erosion, and may never have stood more than about 0.20m above the slightly-domed land-surface upon which it was built, at least in this NW part. It may have been surrounded by a small ditch, which may have been the source of the loose matrix among the stones; and it may never have been intended that the cairn itself should be viewed as a pile of stones. Trench 2 located c.28m NNE of the OS trig pillar, revealed the presence of a prehistoric post-hole. For further details see record ENA1077 (SZE5716). A watching brief was undertaken in 2013 during the construction of a new footpath at the northern entrance. A cluster of gritstone blocks was observed. Those these may be natural , a threshold structure or revetment cannot be ruled out. The new path was constructed so as to preserve these features (SNA67236). 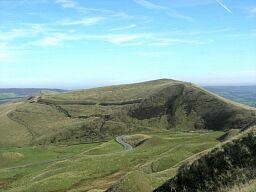 The hillfort on Mam Tor is a well-preserved example of a slight univallate hillfort. Although the earthwork defences are somewhat disturbed by land slippage, and the interior and north entrance by visitor erosion, substantial areas are intact and include the south entrance and the main occupation areas. The use of the tor as a focus for prehistoric burials, illustrated by the two bowl barrows at the south end of the monument (NTSMR 60454 & 60455), demonstrates that human activity on the tor was of considerable antiquity by the time the hillfort was constructed. Bowl barrows are funerary monuments dating from the Late Neolithic to the Late Bronze Age (c.2400-1500BC) and were constructed as hemispherical mounds of rubble or earth covering single or multiple burials. Sometimes ditched, they occur either in isolation or grouped as cemeteries and often acted as foci for burials in later periods. The barrows on Mam Tor survive reasonably well and retain significant archaeological remains. The re-use of one of the barrows as a World War II searchlight emplacement is also of interest (SNA66471 - Historic England's scheduling description last amended, 1993. SNA66471 - Scheduling record: Historic England. National Heritage List of England. https://historicengland.org.uk/listing/the-list/list-entry/1011206. SNA67178 - Unpublished document: Archaeological Research Services Ltd. 2012. Peak District Hillforts: Conservation and Management Audit. p88-103. SNA67236 - Unpublished document: Archaeological Research Services Ltd. 2014. Mam Tor, Derbyshire: Archaeological Watching Brief. SZE10240 - Article in serial: D G Coombs. 1976. Excavations at Mam Tor, Derbyshire, 1965-69 cited in Hillforst : Later Prehistoric Earthworks in Bri. SZE1419 - Unpublished document: L Smith. 1987. The National Trust Archaeological Survey - The Edale Estate (High Peak), Derbyshire, Appendix D: Mam. SZE2422 - Article in serial: I Chalkley Gould. 1902. Mam Tor, near Castleton. 24. SZE3647 - Document: DOE. 1984. Ancient Monuments and Archaeological Areas Act 1979 - for Mam Tor. SZE3908 - Bibliographic reference: Anon. Ancient Monuments List [Camps and Settlements], Castleton, Mam Tor. SZE4479 - Document: Anon. 1966. Mam Tor, Derbyshire, Council for British Archaeology. SZE46138 - Photograph - black and white: Harry Beamish. 01/09/1986. Mam Tor, NW Side from Rushup Edge. 28. SZE5329 - Article in serial: Anon. 1970. ROUND-UP: Excavations '70. 23. SZE5716 - Unpublished document: G Guilbert. 1996. Mam Tor 1993-4: Excavations and Watching-Brief. SZE6275 - Unpublished document: D R Wilson. 1992. Revised plan of work on Mam Tor. SZE6737 - Article in serial: K Smith. 1985. Mam Tor Hillfort, Peak Distrist & Northern Dukeries : a field guide. SZE7031 - Document: Anon. Mam Tor. SZE816 - Article in serial: E J S Gerrish. 1984. The Prehistoric Pottery from Mam Tor: Further Considerations. 103. SZE8300 - Article in serial: D G Coombs. 1979. Excavation of the Hill Fort of Mam Tor, Derbyshire 1965-69. 99.